In this tutorial we’re going to take a closer look at the Lightroom Presets Folder. 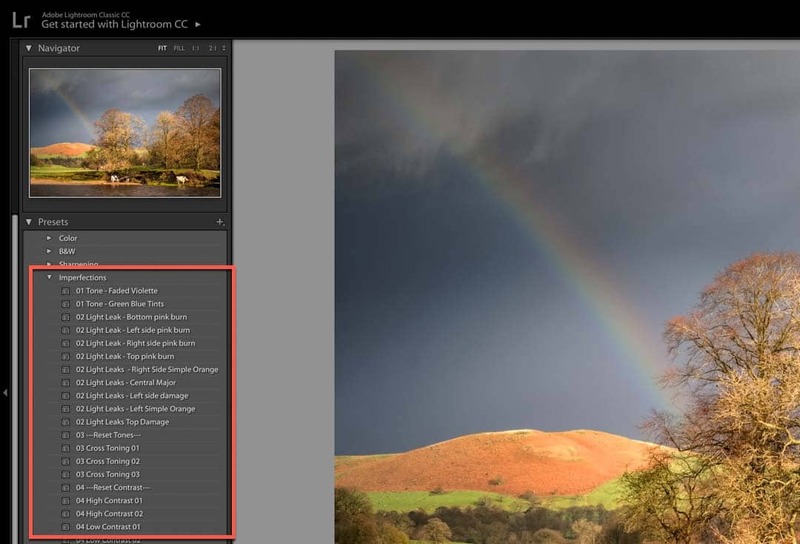 Where it is and how you can use it to better organise your Lightroom Presets. We’re also going to cover some of the recent changes Adobe has made (April 2018) to Lightroom Presets. We’ll discuss how these are making it harder for users to install, manage and find their Presets. I’ll also cover how you can work around these limitations. So many people appear to be struggling with the installation of their Lightroom Presets that I decided to produce a dedicated tutorial. If you’re trying to find the Lightroom Presets folder to install new Presets, I recommend you read/watch my Presets Installation tutorial first. It could save you a lot of time. Where is the Lightroom Presets Folder? Open Lightroom and select the Lightroom Preferences dialog. On a Mac you can select “Lightroom | Preferences…” from the menu. Or, on a Windows PC select “Edit | Preferences…” from the menu. In the Preferences dialog you will see a series of tabs along the top. Click the “Presets” tab. About half way down the Presets page of the dialog you will see a button on the right. This says “Show Lightroom Presets Folder…”. At the time I’m writing this tutorial, the Mac and Windows versions of Lightroom have diverged. If you’re using a Windows PC, you won’t see one button but two. The one you need says “Show Lightroom Develop Presets”. I expect both versions of the software to become aligned again in the future. Once you click the button in the previous step you will see either a Finder window (Mac) or an Explorer window (PC) open. In the new window you’ll see other folders including one called “Develop Presets”. This is the folder containing your Lightroom Presets. When is the Lightroom Presets Folder Wrong? If you follow the above steps and find the Develop Presets, it’s possible that you’re looking at the wrong folder. That’s because when Adobe released version 7.3 of Lightroom (April 2018) they made a couple of changes. One was to the format of the Lightroom Preset files, which became XMP files rather than lrtemplate files. The other was to the location of the Develop Presets folder. Things can easily get a little muddled because the old folders and files are still there, but Lightroom’s using a new folder location. The new location for the Lightroom Presets folder is in the “Adobe\CameraRaw\Settings” folder. On a Windows PC you will find this in the Users folder. Here’s an example where Windows is on my C drive and “rnwhalley” is the user. On a Mac the location’s a little different. Here’s an example from my Mac computer. If you’re using version 7.2 of Lightroom or earlier, organising your Presets is quite easy. Lightroom displays any folders and files found in the “Develop Presets” folder in the Presets panel. If you create a folder in there and copy in some Presets, that’s what Lightroom displays. You can see an example of the Presets panel showing a folder containing Presets in the screenshot below. This makes organising your Presets very easy using either the Mac Finder or Windows File Explorer. You can create folders and move Preset files around as you like. You don’t need to use the Lightroom interface at all. The changes show up in the Presets panel of Lightroom once you restart Lightroom. But the ease of organising and managing your Lightroom Presets doesn’t stop there. The Presets panel has a popup menu which you use to create a new Preset Folder. You just right click on the Presets panel and select the “New Folder” option. Any folder you create appears in then created I the Develop Presets folder. There’s also menu options to Delete and Rename existing folders. Again, any changes you make are reflected in the Develop Presets folder. Now if you’re using Lightroom v7.3 or later, some of these features are missing. 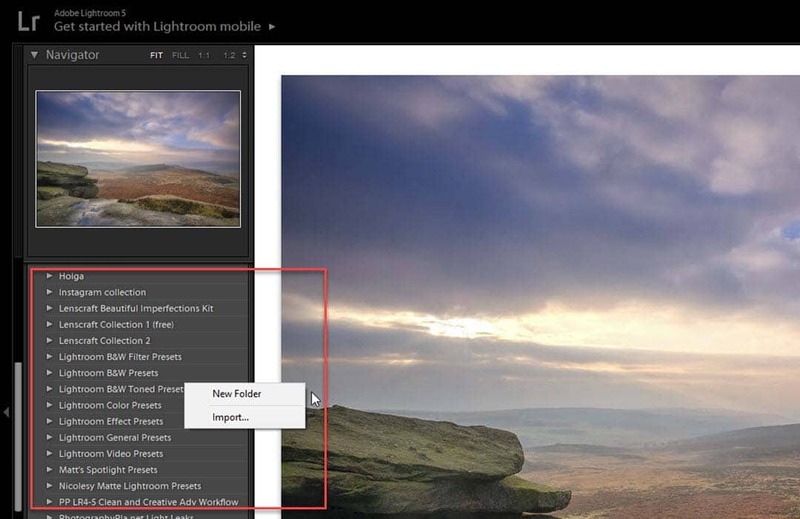 In version 7.3 of Lightroom, the option to create a new folder is gone. It’s now only possible to rename or delete a Group (that’s the new name for a Preset Folder). Also gone is the ability of Lightroom to reflect any changes you make directly in the Presets folder. Or should I say Settings folder now the location has changed. This means you shouldn’t use the Mac Finder or Windows Explorer to organise your Presets. Lightroom won’t reflect any changes you make using these tools. If you want to understand why, my Presets Implementation tutorial explains what’s happening. Instead, the way to move your Presets between the different folders, sorry Groups, in the Presets panel is by dragging and dropping. You need to use your mouse to move the presets around. Import a Preset. As explained in my Presets Implementation tutorial, when you import Presets, Lightroom places them into a group called “User Presets”. 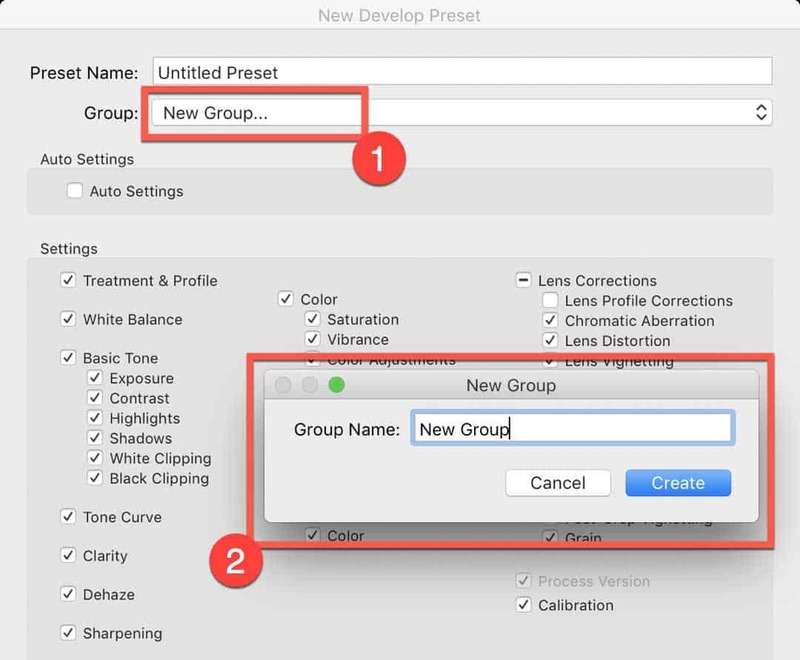 If the group doesn’t already exist in the Presets panel, it’s created automatically. You can then rename the group and delete the imported Preset. Create a new Preset. You can do this using the ‘+’ icon to the top right of the Presets panel. Click this and select the “Create Preset…” option. This displays the create new preset dialog where you can select a group to save the new Preset to. One of the options in the Group dropdown is to create a “New Group…”. Once the groups created, you can rename it and delete the Preset you saved. Through the changes made to Lightroom 7.3, Adobe has simplified the organisation/management of Lightroom Presets. Unfortunately, at the same time the changes appear to have complicated things for a lot of existing users. The best approach now to organise and manage your Presets is to use the features of the Lightroom interface. If you’re using an older version of Lightroom (pre v7.3) and know how to manipulate folders, you can still edit the folders and files directly. in the latest version 7.3 onwards I have noticed that preset groups may also now be displayed on the Presets panel separated by line ——– but there seems to be no way to manage where these are, visually to be able to organize my preset folders/groups into different sections separated by one of these lines would help to further organize the develop presets. any ideas on how to do this? That’s something that I also wanted to do. If there is a way it isn’t obvious. To be honest, I think Adobe has done half a job again. Often though when they do this it’s because they are working on further improvements. Hopefully future versions will enhance this.